Hobby-eStore Blog: Double Horse 9101 - Large 29 inch Helicopter! 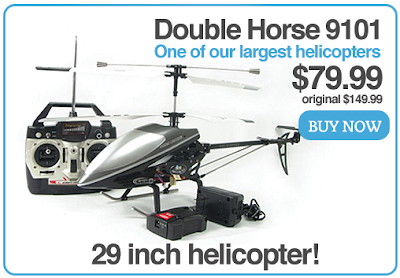 Double Horse 9101 - Large 29 inch Helicopter! All New from Double Horse RC Helicopter, this is the largest Double Horse RC Helicopters product in the market! About 2 Inches longer than the Double Horse 9053, This is the new 450 sized Double Horse 9101 3 Channel helicopter. The 9101 is uniquely built with a sleek design and alloy structure, making it the most impressive and durable helicopter in its class. It comes equipped with a built in gyro, offering you unrivaled stability, with an advanced intelligent balance system, you'll never lose control. The Double Horse 9101 has a fully functional, all around 3 channel control system. so you can fly in any direction. The 9101 measures at almost 29 inches in length, with almost 11 inches in height. The look and feel is comparable to the most respectable helicopters available for the more information on this amazing helicopter. Double Horse is making some VERY good machines lately (The 9100 series in general is FANTASTIC), and I think this one's now on my WANTED list. Their single-rotor 3 channels are about to change everything we accept about hobby copters, I think.